The subject promised by today’s title has been simmering on my back burner for a long time, but now that the essay on simpleton is out, I am ripe for tackling it. Lunacy and folly began to interest me in connections with the words mad and dwarf. Mad is puzzling because its Middle High German cognate means “pleasing, pleasant.” The solution lies in the fact that the original root seems to have referred only to “change,” as in the Latin verb mutare, from which English has numerous references to mutability. (Remember how the protagonist of Wilhelm Hauff’s “Caliph Stork” and his companion said mutabor, mutabor and turned into birds? (No magic works like knowing the first person passive singular of the first conjugation, futurum, in Latin.) While in their new shape, they were prohibited from laughing, but, naturally, broke the interdiction and ran the risk of never losing their wings.) Change is a broad concept, so that it does not come as a surprise that the offspring of the ancient root developed into several unpredictable directions: from “altered” to “mutilated; deranged” and their opposite “pleasing.” Such are the inscrutable ways of historical semantics. Dwarf is an even more difficult case. I believe that the original form of the noun, extant in all the Germanic languages except Gothic, was dwesgaz. (We know mainly a fourth-century translation of the New Testament into Gothic. The word for “dwarf” does not occur there, though it probably existed in the language and sounded like dwizgs, masculine or neuter.) This dwezg- may be a cognate of Engl. dizzy and Dutch dwaas “foolish” (an almost the same adjective occurred in Old English). Dwarfs, I suspect, far from being creatures like their namesakes in the Grimms’ fairy tales and Disney movies, made people “dizzy” (that is, deprived the otherwise normal and healthy individuals of the power of reasoning), just as elves made them elf-shot (afflicted with a disease supposed to come from a wound by an elf), and the Greek gods made them “en-thus-iastic,” which might be good or bad, depending on how far their “enthusiasm” went. (Compare crazy below.) Engl. giddy also meant “possessed by a god or spirit.” So it happened that, enveloped in etymological dizziness ~ giddiness, I began to look at the origin of words meaning “mad” and “foolish.” Some of them have a curious history. Daft goes back to Old English, in which its sense was “mild, gentle, meek” (the root, again on the evidence of Gothic, meant “be, become fit”). Why “fit, suitable” yielded “stupid” and “bereft of sound judgment” is far from clear; nor does the presence of Middle Engl. daff “simpleton, fool” of unknown origin dispel the obscurity. To confuse us even more, we notice that daft is a doublet of deft. Originally, deft also meant “gentle, meek,” later “skillful; neat; pretty.” The starting point of daft and deft was the same, namely “fitting, convenient.” Language shows that the world seldom appreciates virtue. Gentle and meek people are “mad,” and so are those who are too trustful, as evidenced by German albern “stupid” (no connection with elves), from alawari “friendly”; English and Icelandic had close cognates. The starting point was “trust, confidence.” Don’t confide in your fellow men—such is the message of the Old Icelandic poem titled “The Speeches of the High One”; the High One is Odin, the greatest god of the Scandinavian pantheon. It is not improbable that the following words were derived from the same root, even if the second batch represents a different vocalic grade: Old Icelandic dapr “sad,” German tapfer “brave” (from “heavy, weighty”? ), Dutch dapper, again “brave,” but Engl. dapper “neat, trim.” From “heavy” to “powerful”? From “powerful” to “brave”? But “trim” and especially “sad”? Even Russian dobryi “kind” and Latin faber (as in Engl. fabric, fabricate) possibly belong here. Virtues and vices, joy and sadness appear entwined. Mad and sad, witless and skillful, meek and powerful, heavy and trim…. The knot is hard to unravel. Silly, known only since the late Middle English period, is, from a phonetic point of view, a continuation of seely “happy, blessed.” The Standard has a few words in which short i was changed before a single consonant to close long e (as in German Heer “army”) and turned by the Great Vowel Shift into long i (the vowel we hear in Engl. eel). Occasionally the deceitful, deceptive modern spelling reflects the old form, as happened, for example, in the word breeches (pronounced and occasionally spelled as britches), in which the same change of short i to long i has occurred. Seely “blessed” poses no problems. German selig still means the same. The noun from which seely was derived meant “time; occasion; good fortune; happiness,” and we have Gothic sels “good, kind.” Someone who is too happy must be silly. An excess of valiance may result in sadness. This is all in line with the wisdom of the High One. 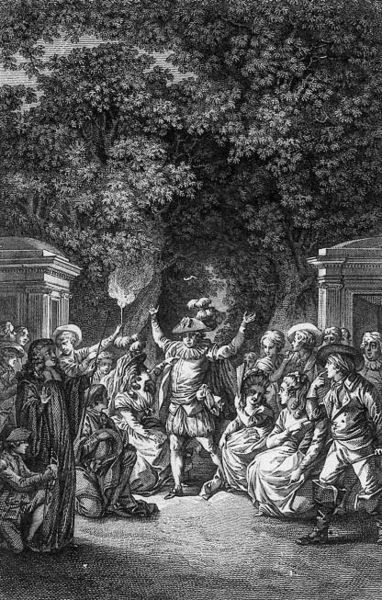 Illustration from La Folle journée ou Le Mariage de Figaro. Jacques Philippe Joseph de Saint-Quentin. Bibliothèque nationale de France. Public domain via Wikimedia Commons. Imbecile (from French, from Latin) did not signify a person of low intelligence. The etymological sense of Latin im-becillus was “weak,” presumably from “unsupported,” for baculum meant “stick, staff.” Thus, from “unsupported” to “feeble” and “feeble-minded.” The etymology of idiot is well-known. It too made the familiar way from Greek into Latin and from there into French and English. The Greek idiot was a private person, one not engaged in public affairs, hence a despicable ignoramus. Idio– “one’s own, private” is familiar to English speakers from idiom (“a peculiarity of language”) and idiosyncrasy. Linguists also use the term idiolect “the speech habits peculiar to a particular person.” One cannot even stay away from an active engagement in public affairs without being called an idiot. That is probably why people sitting on numerous committees are so smart. Such is the tale told not by, but about idiots. Many of my old chinaware teapots are crazed on the inside, and I’m probably daft to collect so many. Enjoyed this blog no end. I am having a bit of a hard time with long and short vowels. Teaching ESL students pronunciation required simple rules. It’s years ago now but I remember the phonetic instructions that long vowels went like this: aye, ee, eye, oh, you. Short vowels were pronounced at, et, it, ot, ut (never mind all the exceptions) – that’s not how I taught it visually, but how they ended up being pronounced. In your blogs, I find that ‘long’ vowels aren’t ‘long’ at all to my ears, so are there different rules about what are called ‘long’ and ‘short’ vowels? I know this hasn’t anything to do with etymology, but there seems to be such a difference. Un fou, in chess, is a bishop. It was so named because un fou was a court jester, and, on the chessboard, this piece is close to the king. It has superseded the Old French name alfin, aufin, from Arabic al fin, elephant – this piece used to be represented by an elephant. This is about the word CAMP. I just learned about the secret language of Polari. I find it fascinating – British men would drop a word or two casually into conversation to try to identify other gay men. It reminds me of other secret languages created by practitioners of outlawed religions. I looked up a list of Polari vocabulary tonight, and found a site (http://chris-d.net/polari/) that confidently explained that the term ‘camp’ came from ‘KAMP = Known As Male Prostitute.’ I’ve heard folk etymologies that involve acronyms before, and they are pretty much all wrong. The OED only says ‘Etymology obscure’ at the top of the page. Is this another example of years of research culminating in two words, or is it an area that is ripe for research? How can I tell if a word history is under-studied or over-debated, when all the big dictionaries tell me is ‘origin unknown’? I continue to appreciate your bi-monthly gleanings, and I’m looking forward to your presentation at SHEL-8 this week. I might hug you.